Tucson, Arizona—Leonard Green, age 67, was killed by a hit-and-run driver as he sat on a bench waiting for the bus last Wednesday night. A woman also was injured. Tucson Police arrested Ruben Aulbert Lemon, age 33, Saturday night at a residence in the 100 block of East Pastime Road. Lemon is charged with leaving the scene of an accident involving death. Other charges may be added later. Tucson Police Department accident investigators report that Mr. Lemon allegedly was traveling south on Alvernon Way when he made a left turn onto eastbound Pima Street at a high rate of speed. 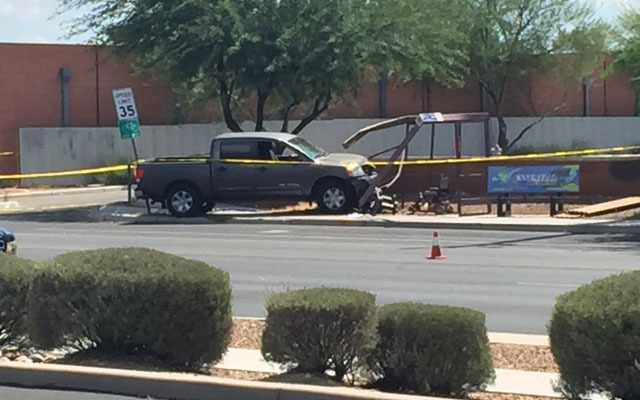 His Nissan Titan pickup truck left the roadway and struck a bench at a bus stop on the south side of Pima. Mr. Green and the injured woman were transported to Banner University Medical Center where Mr. Green later died. The investigation by Tucson Police Department continues. Anyone with information is urged to call 88-CRIME. We extend our condolences to Mr. Green’s family and friends over this tragic loss.